In the current single ply roofing market, the two most popular options are thermoplastic membranes PVC and TPO. PVC has been successfully used in commercial and residential roofing since the 1960’s, while PVC is a newcomer, and has been around since early 1990’s. TPO is being touted as the more improved and cheaper version of PVC, and as a result has been steadily gaining in popularity. However, the reality is that when it actually comes down to longevity and performance, PVC has a long proven track record of performance, which TPO lacks. If you are on the fence whether to go for a PVC or a TPO membrane, learn more about these membrane’s similarities, as well as important differences, to help you make the right decision for your home or business. It is the differences between TPO and PVC that need to be carefully analyzed, as they ultimately determine each roof’s performance, and longevity. The most significant difference between TPO and PVC is their chemical composition. PVC (polyvinyl chloride) is made up of ethylene and chlorine. Petroleum or natural gas is processed to produce ethelyne, and chlorine is derived from salt. PVC sheets contain plasticizers, stabilizers, ultra-violet light inhibitors, biocides and polyester or fiberglass reinforcement, all of which contribute to the membrane’s flexibility and durability. TPO (thermoplastic olefin) is a blend of polypropylene and ethylene propylene polymers, which is usually reinforced with polyester. TPO sheets contain colorant, flame retardants, UV absorbers and other substances that make TPO flexible and resistant to the elements. In theory, TPO membranes are supposed to be more durable and long lasting that PVC, because there are no plasticizers in chemical make up of TPO. Because PVC membranes contain these plasticizers, overtime they arguably break down and migrate to the surface area of the top layer over time, which ultimately leads to the membrane’s shrinkage and tears. However, in practice the situation is very different. PVC membranes have a proven track record of performance. 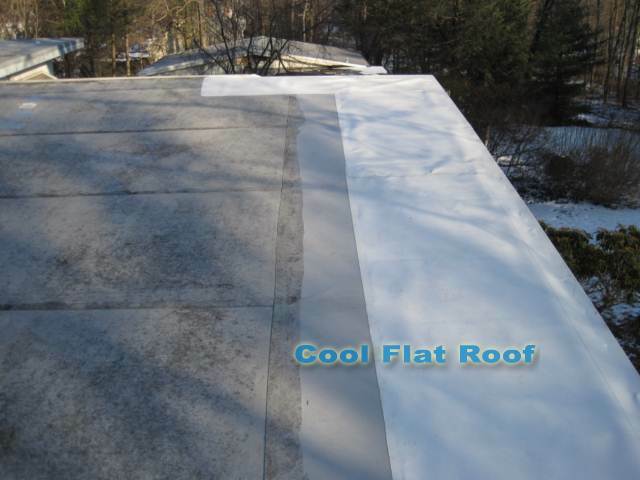 Membranes that have been installed on commercial rooftops over 30 years ago are still there today. These membranes have been able to withstand a wide range of weather conditions, temperature variation, ponding water, remaining completely watertight and in tact. The original formulation that has first been developed in Europe in the 1960’s is still followed today with little changes, and it works. Moreover, PVC membranes are manufactured in accordance with strict ASTM standards that have been developed for PVC membranes decades ago. By contrast, the fairly short existence of TPO membranes in the US is marred with numerous documented roof failures and product recalls. The reason is simple: the original formulation that was also developed in Europe, has been tampered with and altered many times by numerous US manufacturers to lower the cost of manufacturing. Unfortunately, by trying to cut corners and save money, TPO membranes have taken a major hit in terms of performance and longevity. Over the course of their existence, there have already been at least 3 new generations of TPO, all with slightly different chemical compositions. The newest TPO membranes are less than 5 years old and there is no data to support how low they will last. In particular, TPO roofing membranes are known to go through accelerated weathering when subjected to high thermal or solar loading. This issue has been documented on numerous TPO membranes in Southern states that get a lot of heat and sun throughout the year. 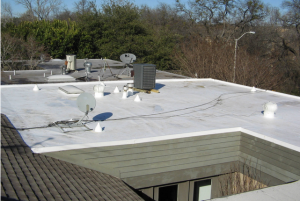 As a result, the MRCA committee issued TPO Advisory detailing the problems and made a recommendation to roofing contractors to install a product that has a proven track record of withstanding the loading. Another significant issue is that for many years there have been no clear ASTM standards for TPO, and only in recently these standards have been developed (however, they too continue to be revised and improved). Overall, while it may be the case that the composition of TPO may in fact be superior to PVC when the manufacturers get it right, currently the formulation is still being experimented on. Ultimately, you have to decide whether you want to pay more money for a time tested PVC membrane, or save money and take a chance with a TPO membrane, hoping that you get a formulation that will be durable and long lasting. Kool Aid anyone?? Or just do your homework and find a proven TPO product and pay almost 1/2 the price. So funny. Just like PVC membranes had their horror stories (and there are plenty), TPO has had some difficulties. Some are better than others just like PVC. Would you still pay $15,000 for a plasma TV? Technologies advance and manufacturers figure out how to make products better for less. Most people get that now & that is why TPO is the largest segment of the US single ply market BY FAR & is showing no signs of going away. I just wonder what the kool aid drinkers are going to be pointing out 10 years from now when TPO has over 25 years of performance under its belt. We are at 15 and counting. This argument is getting really tired already. On a residential roof you don’t even feel the difference. On commercial, insulation is a much bigger factor in total system cost, and besides for big jobs you always get volume discount. Are you on payroll of big TPO manufacturers? And even if you have a 10000 sq. 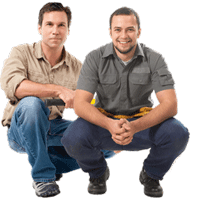 ft. roof and PVC does cost 10 cents more than TPO – difference is $1000. Would you rather have a proven tech that works or be a part of 20 years experiment Version 4.0 (experiment that resets every 5 years with new formulation dumped on market, after previous one failed)? Any source for military not using TPO on permanent buildings? What’s funny is that P.V.C is usually what I’m ripping off the roof and replacing with T.P.O. or if appropriate E.P.D.M. -put that in your kool-aid and drink it!!! Sorry I hit a wrong button and send the message. There is a big difference in the PVC membranes, no 1 is thickness some manufacturer’s provided very thin only 30 some mils and they did not perform very well. I was just on roofs that were installed in the early 80 ‘s making them 30 plus years in service.. the sheet was still weldable and easy to repair. Most TPO’s have been reforumulated so many times that now peel and stick is the only way to make repair. I think its very irresponsible installing TPO’s or EPDM on schools, hospitals etc just for flame spread. Also neither are recyclable like PVC is. PVC after 25 to 30 years of performance was able to be ground up and make into more PVC roofs. Pretty Good Kool Aid, I always like Lime. Good Luck to all..and a moment of silence for the roofer who died in an accident on the Vikings Stadium..being safe is what counts. Phil, Got picture to show proof? I’ve seen only one PVC that MAY have needed replacement – 25 years old Sarnafil … but I patched it with IB patches and it is as good as new!